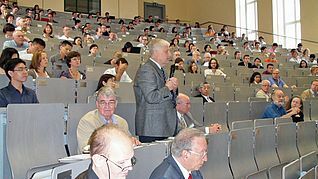 Close to 250 registered participants from 31 countries met in the "Audimax" of the University of Tuebingen from July 25 to 29, 2010, to present their research into the mechanisms of myopia. 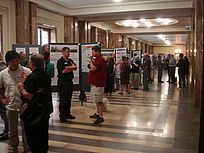 In addition to 76 invited talks and 4 key note lectures, 98 posters were presented in the nice "Wandelhalle", both at the meeting floor and below. Myopia is world-wide rising in correlation with industralization and urbanisation, and reaches an average of about 30 percent most countries. In East Asia, the frequency of myopia is much higher, and its frequency is still rising: it was reported at the meeeting that in 1996-97, 79.3% of the military conscripts in Singapore were myopic, and now 81.5%. A speaker at the meeting checked his 20 colleagues from HongKong who travelled with him to the meeting and found that 19 of them were quite myopic. Given that high myopia increases the risk of ocular complications and blindness (in some countries, myopia is the second-most reason for blindness), understanding of the biological mechanisms for the development of myopia is urgently necessary to make it possible to develop strategies for its inhibition. Only few areas of research combine expertise and techniques from so many areas as myopia: optics, psychophysics, genetic screening (genome-wide association studies), epidemiology, knock-out mouse models, electrophysiology, molecular biology, immunohistochemistry, and others. At least 8 different animal models are studied and there is an increasing number of studies in humans, both targeting epidemiological and genetic screening questions. The bad thing about myopia is that (as a speaker put it) "the genetics of myopia resembles the genetics of height - many associated gene variants, each only with a small effect". Therefore, genetic mapping provides many loci, and many different genes all involved in the control of axial eye growth. Furthermore, myopia is a key example of gene-environment interaction, and individuals who are not exposed to the critical visual experience (probably largely indoor activity and "educational achievement") may not become myopic. As presented at the meeting, it was shown in chickens that selective breeding for rapid myopia development with frosted eye occluders increased myopia extremely, after only two generations. Selection of animal that developed little myopia caused even hyperopic refractions in some animals with occulders - apparently, the genetic background is normally set to generate intermediate refractions but selection can move the refractions rapidly both ways after only two generations. At the end, myopia may be considered genetically similarly complex as age-related degenerative diseases like Alzheimer, cardio-vascular diseases or Parkinson - only that it happens earlier in life and is the most frequent ocular disorder of the young people. The meeting presented many provocative findings and hypotheses which will be verified or rejected in the future. For instance, it was discovered that the ratio of long (L) wavelength and mid (M) wavelength cones in human subjects is highly correlated with myopia. This finding, if it stands up, is certainly a completely new link between genetics and myopia and would provide a perfect predictor of the individual risk of myopia development. In terms of the consequences of L to M cone ratio on visual processing and myopia development, everybody is puzzled - people with different L to M cone ration are known to have normal color and spatial vision. Another puzzling hypothesis was that cones are able to detect the position of the best focal point the light rays within their outer segments - although the photoreceptors have waveguide properties, which largely excludes that they can detect a "focus", and they also appear much too short to provide a useful focus signal. Another new aspect was that, while chicks, monkeys and guinea pigs can compensate for lenses that are placed in front of the eye by growing faster (with negative lenses) or slower (with positive lenses), guinea pig eyes can no longer compensate positive lenses when the optic nerve is cut - apparently, the mechanism for growth inhibition is blocked. It is not known whether this is true also for monkey and humans, but if so, the inhibitory signal for eye growth may finally involve the brain after all. Most previous animal studied have shown that the visual control of eye growth occurs through a retina-RPE-choroid-sclera pathway. A new approach to reduce myopia progression is the development of lenses that impose myopia to the periphery of the visual field which generates an inhibitory signal for eye growth, imposing the risk that an insufficient optical correction exists for the fovea. Different spectacle and contact lens models are currently developed and tested in children and, while the effects are small with some lens designs, it is likely that this can be optimized and satisfactory inhibitory effects can be generated for myopia in the future. It is clear that this area is of interest to spectacle lens designers and the interest of the optical industry was obvious. 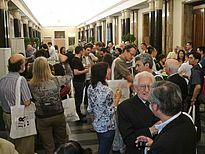 The meeting included for the first time two sessions on high myopia - myopia that developed beyond the optical range where one would assume that visual feedback can still play a role. In this condition, retinal and scleral complications provide a risk for visual function, and the progression can be reduced only by quite invasive strategies like scleral buckling (an strengthening tissue is attached to the sclera) or scleral crosslinking (a chemical compound is provided to the sclera with increases the collagen fibre crosslinking when exposed to light of a certain wavelength). Since both have to be applied to the back of the eye, it is clear that these are invasive procedures and the procedures are not yet commonly used. The meeting was accompanied by two social events: a concert with dinner in the famous "Sommerfektorium" at the monastery in Bebenhausen, and an excursion to the Hohenzollern Castle, with guided tours, followed by a nice dinner in the Restaurant "Casino" downtown Tuebingen. In the "Sommerrefektorium", Jochen Brusch (www.jochenbrusch.de), with his baroque orchestra, performed Vivaldi's "Four seasons" and "Air" from the 3rd orchestra suite by J.S. Bach. 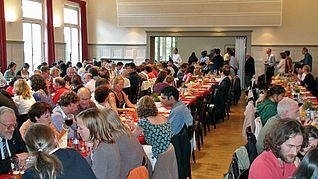 At this particular evening, as well as during the meeting itself, excellent catering was provided by Hotel "Krone" in Tuebingen. The meeting was generously sponsored by the Madam-Curie Research Training Network "MyEuropia", the German Research Council (DFG) on the public side, and by a number of private sector sponsors (listed in the program, see www.imc-2010.org). The meeting was a great success, as reflected by many comments of participants. Some mentioned even that this was the best myopia conference they had seen, both from the scientific contributions as well as the organization of the program - an honor that goes to the local organizing staff (people from the lab of Frank Schaeffel and Marita Feldkaemper, and the Research Management Unit of Thomas Wheeler-Schilling), as well as the local and international organizing committees. 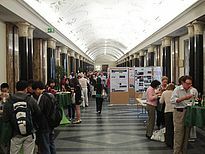 However, perhaps the most important factor for the success of the meeting was that the "myopia community" is an extremely interactive and open group of several hundred researchers (mostly biologists, physicist, physicians, optometrists and psychologists), and intense discussions accompanied the entire meeting and the evening programs. Please note that no authors are mentioned in the text since only very few points were picked and other authors may have missed a reference to their, also important, contributions.